Part of being a bespoke wedding dress designer, is staying on top of upcoming trends and making a collection. 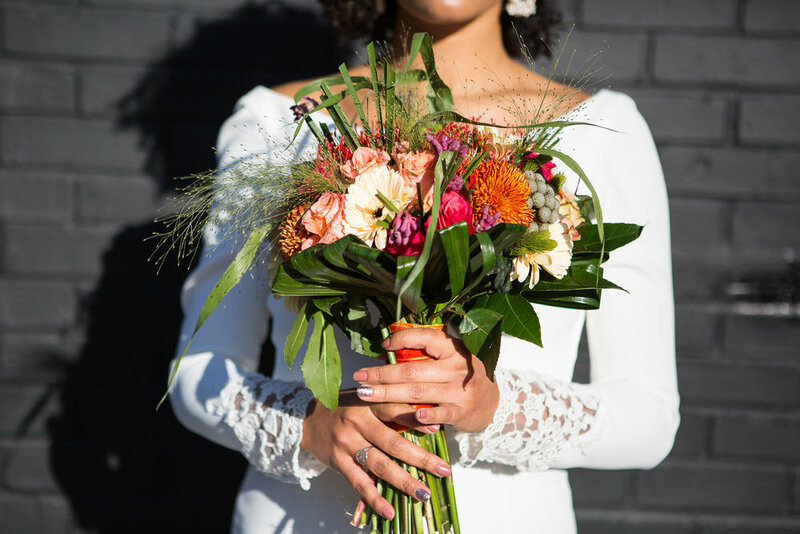 This is what we do each spring and autumn and so, this is our forecast for 2019-2020 wedding trends. Whether it is midriff exposing or not, two pieces are on the increase. This has blended in to bridal wear with influence from high street fashion trends. Bodices’ are often paired with soft skirts, to balance the look of the dress. Our prediction is that the tops will be more detailed in lace or bead work, and necklines are likely to be off the shoulder or racer neck. We LOVE this trend! Whether it’s lace, chiffon, wool, or crepe, the capes are here. Expect to see these as an alternative to sleeves or a veil, adding drama or length to a wedding look. Wide legged, or tailored, there is a trouser shape for everyone. This new wedding trend can work alongside the two-piece trend,so trousers can be switched in the day if desired. As so many more weddings are being held outdoors or in more exotic locations, trousers are not only practical, but look cool too! You guessed it… Meghan Markle set this trend into motion in May 2018. Following that, princess Eugenie also wore brocade sleeves in October, sealing the deal so to speak. Sleeves will be more popular for weddings in spring, autumn and winter, but we believe they will look amazing, no matter when you choose to wear them. What’s not to love about a light, floaty, soft skirt. They look great no matter what length you choose, and you can create a gorgeous long train without having to hold heavy material. This trend has become popular as comfort is becoming a key factor to brides choosing their wedding dress, conscious that they will be in the dress all day, and want to be able to eat, and dance without any restrictions.